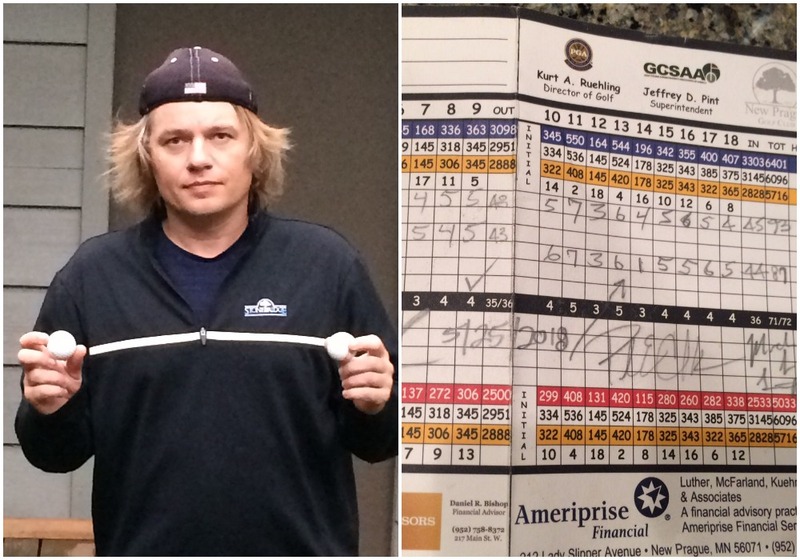 Before Michael Lutgen hit his tee shot May 25 on the 14th hole at New Prague Golf Club — the same spot from which he had produced a hole-in-one two days prior — two things happened. Before Michael Lutgen hit his tee shot May 25 on the Par-3 No. 14 hole at New Prague Golf Club — the same spot from which he had produced a hole-in-one just two days prior — two things happened. First, his playing partners Paul Clark and Kevin Schoenbauer offered to bet him $10 that he couldn’t do it again. Sensing it was unlikely (and then some), Lutgen replied that he would need at least 500-to-1 odds. There were no takers. So Lutgen, 42, strolled to the tee box. The hole had played at around 177 yards on May 23, when he hit the first hole-in-one of his life. On this day, it was playing at 182. But he chose the same club, a 6-iron, since he had been hitting into a light breeze two days earlier. As he was about to hit, those helpful playing partners shouted to another group on a nearby green that Lutgen had made a hole in one a couple days ago. Everyone agreed, mostly jokingly: let’s see if he can do it again. Rare for most. Something that happens multiple times a week, apparently, for Lutgen. “I should say I’m not a great golfer by any means,” said Lutgen. He finished with an 87 and an 83 on the two rounds — decent scores, better than most of us can do, but still well over par. His scorecards were littered mostly with 4s, 5s, 6s and even a 7 — except for those glorious 1s. So how do we explain this? Well, there’s an element of luck to every hole-in-one since even the best professional golfers only hope to get the ball close to the hole. Two, Lutgen — who returned to Minnesota recently after living in California – grew up on New Prague GC. About two weeks before his aces, he ran into the son of an old neighbor who had recently passed away. Lee Reishus is the son. His dad, Ross, was an avid golfer who played the course often. Beverly — Lee’s mother — still works in the pro shop. Lee Reishus went and grabbed a bunch of Ross’ old golf balls and gave them to Lutgen when they had their chance meeting. And Lutgen was using the balls during both of his holes-in-one. Lutgen bought the requisite round of drinks for clubhouse folks both times and was happy to do it. If he only has those two aces, it should still be a pretty good golf season. What's the NBA mock draft consensus for Wolves?